Photographing this couple at Evergreen Brickworks in Toronto, Ontario, was a perfect opportunity to compare soft elegance with hard urban elements. 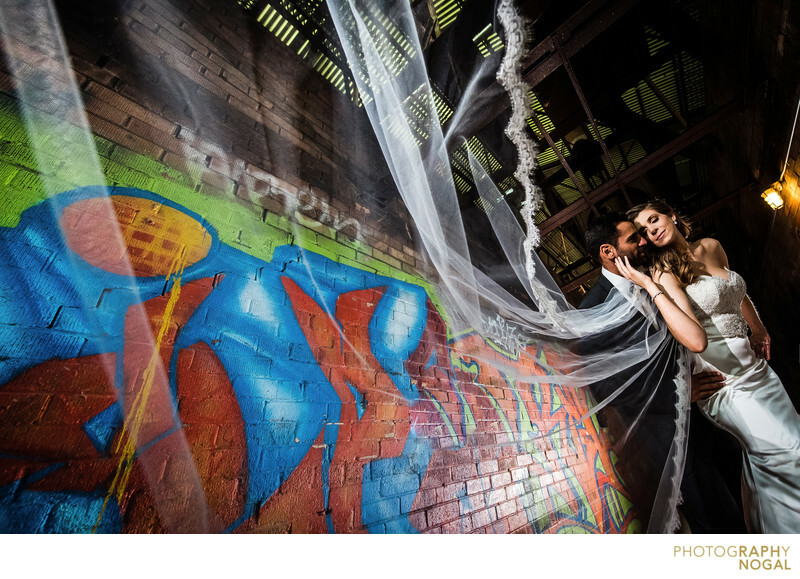 This picture features the bride’s veil flowing gracefully across the picture, in front of graffiti on a brick wall. The juxtaposition of urban architecture and a delicate veil creates an editorial feel, while the positioning carries the eye from left to right, settling on the couple. This photo was taken with a Nikon D750 DSLR at ISO 2500, f5 aperture, 1/200th shutter speed with a Nikon Nikkor 14-24mm f2.8 zoom lens, at 14mm focal length. The lighting was a flash on a monopod, held by Oliver. The flash contained the MagMod grid (MagGrid) to narrow the beam of light and creating a softer light falloff on the edges. There was also a bare head flash in the back and used as a backlight to help illuminate the vail details from the back.